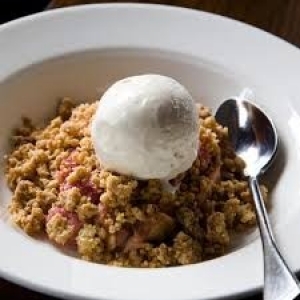 This crumble can be added to any stewed fruit dessert. It makes enough crumble for a regular sized pie dish. Jazz up your crumble by adding any of the following; chopped roasted hazelnuts, pepitas, oats, coconut, grated orange rind or cinnamon. Combine ingredients by pulsing in a food processor or rub butter into flour and mix in remaining ingredients. Sprinkle over stewed fruit and bake at 180C for 25-30mins or until golden brown. Serve hot with your favourite ice-cream.